We can credit the genius of Phoebe Philo for bringing back the Birkenstock out of grandpa’s closet and onto our must-have shopping lists for spring. Céline’s fuzzy, fur-lined sandal kicked off the third coming of the comfort shoe legend last year. After a year in the spotlight, Birkenstocks have returned for a second year with practically every hip label, from Givenchy to Zara, has some sort of a version just waiting to make you look orthopedic. When it was introduced to North America in 1973, Birkenstock’s two-strap “Arizona” men’s sandal was the antithesis of the decade’s bare chested machismo ideal. It didn’t take long to be adopted with outdoorsy types, becoming a go-to for camping and campus-ing alike. Its launch, however, didn’t inspire the fashion crowd until the now-infamous 1990 The Face editorial, featuring teenage Kate Moss, shot by the late Corrine Day, wearing rolled up jeans with white Birkenstocks, and not much else. It was a far cry from company’s humble beginnings in 1774 Bad Honnef, Germany, when Johann Adam Birkenstock first registered as “vassal and shoemaker.” It wasn’t until hundred years later that the brand would get its first breakthrough, when the founder’s grandson Konrad Birkenstock created the shoe’s legendary moulded footbed. He spent the next two decades trying to obtain an investor for a commercial product. Eventually, Birkenstock found one when the orthopedic workshop of the Frankfurt Friedrichsheim hospital hired him to custom-make shoes for wounded First World War soldiers. Thus, the shoe’s ‘blue footbed’ sole became the company’s trademark. This spring, thanks to their everlasting comfort, and the breezy, carefree attitude of the runways, Birkenstocks are bigger than ever. The brand hit the New York runways with Trina Turk and Houghton, and collaborated with the king of Japanese cool, Yohji Yamamoto. The cool kids, Isabel Marant and Riccardo Tisci, appropriated the classic style into their own versions. Whether original, or inspired, the sandal is now a bona fide Instagram star: hashtag #birkenstocks or #birkies, for short. Kiwi women can shop and be charitable at the same time, at a new designer clothing store set up to help victims of domestic violence. On April 30, Women's Refuge will launch its first Yellow Belle recycled designer boutique in Takapuna, Auckland. Stocked with high-end pieces donated by Kiwi women and designers, the store's profits will go towards raising money for the organisation. To mark the opening, a one-off dress by Trelise Cooper will be auctioned to raise funds. Women's Refuge chief executive Heather Henare said Yellow Belle would be the first of what will become a chain of stores throughout the country. "In this day and age charities have to get quite wily about how we find sustainable and alternative sources of income to complement government funding, our annual appeals and important donor supporters," she said. Women's Refuge services helped 20,000 women and children each year, and nearly two thirds of its workforce was unpaid. "It takes a passionate community of people to keep New Zealand women and children safe and Yellow Belle was initiated to provide some of the important additional funding we need to keep providing services to these families." Yellow Belle Project Manager Stephanie Garvey said she had received "stunning" collections of clothes from all kinds of people. She said items that could not be sold at the boutique would be given to women and children who often ended up at safe houses with only the clothes they escaped in. The flagship store was on Hurstmere Road, Takapuna. People who are interested in donating high-end garments or having a corporate collection box at work can contact info@refuge.org.nz. Yellow Belle was sponsored by NZ Sculpture OnShore. 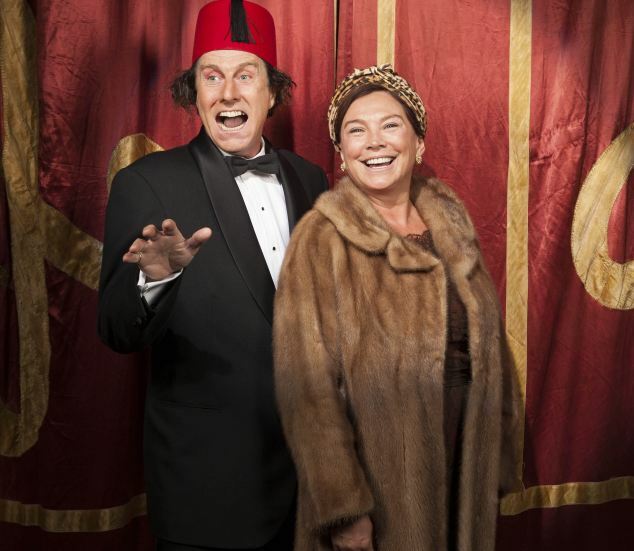 So Simon Nye’s biopic, Not Like That, Like This (ITV), made a perfect start when it had the gangling, gape-mouthed comic on holiday in an Egyptian bazaar, buying a maroon fez — his trademark headgear — from an Arab vendor who was doing an abysmal Tommy Cooper impression. We had the sleepy meerkats propping each other up, the great white sharks tossing seal cubs into the air in their jaws, the polar bear struggling on a melted ice floe, the bearded vultures soaring on blasts of thermal air, and the sun-worshipping lemurs . . . all the best snippets from countless lavish nature documentaries. Matthew Macfadyen strung together the clips with a voiceover, something about how animal behaviour changed as the day wore on, but it didn’t make a lot of sense. Macfadyen seemed to think that the sun rose at the same moment all over the planet, and he’d forgotten that most animals are nocturnal anyway. But the glorious visuals were a delight and the spaced-out music was hypnotically relaxing. Across the country, millions were nodding off in front of their tellies. All that Easter chocolate and the odd Bank Holiday tipple caught up with us . . . ‘just like that’.